Did you ever wonder why a dedicated outdoor air system ("DOAS") is important for a school building? The reason is something called the "SHR". What is an "SHR" you ask? "SHR" stands for "Sensible Heat Ratio" and it is a way to determine how much of the total capacity of an HVAC unit is used for sensible cooling versus latent cooling. 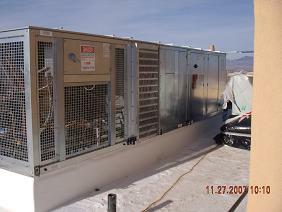 As you know, the latent cooling ability of an HVAC unit determines how well it can dehumidify the air it is supplying. In a perfect world the design team would select an HVAC unit with an SHR that exactly matches the SHR of the space it is trying to temper. However, our world is not perfect and has actually gotten more "imperfect" over the last decade. What has occurred is a change in both standard HVAC equipment and classrooms. In the drive to reach higher and higher levels of efficiency, equipment manufacturers have been increasing coil surfaces and increasing the ratio of sensible cooling to latent cooling...creating a higher SHR. Years ago packaged HVAC equipment had SHRs in the range of 0.5 to 0.7. If you surf the Internet and look at the specifications of small packaged equipment today you will find SHRs of 0.7 to 0.8...meaning only 20% or 30% of the capacity of the unit is available for controlling latent heat. In the meantime, programs such as LEED have created tighter and tighter buildings with shell loads that become almost insignificant. Since the shell loads are all sensible you can begin to see the developing problem. If you then cram more students in a classroom, as is common in most school districts, the latent contribution from student respiration goes up and the overall classroom SHR goes down. Throw in the ASHRAE 62.1 ventilation air requirement that is also heavy on latent contribution and the result is a typical classroom that could have an SHR of 0.60 to 0.65. As a general rule...any time the SHR of the space is lower than the SHR of the HVAC equipment serving the space then the humidity level of the space will increase. Since the packaged HVAC equipment controls respond to sensible heat (a conventional thermostat) the result is a unit that shuts off before enough moisture is removed from the air and the room becomes "stuffy"...or the teacher lowers the room setpoint to force the HVAC unit to run longer and the result is wasted energy and a cold room. The solution is to take the outside air component out of the classroom units, reducing their sensible heat capacity to match the sensible heat load of the space, and put the ventilation air into a dedicated outdoor air system ("DOAS"). A well designed DOAS will be created from the start to dehumidify the air before it gets to the classroom, leaving only student respiration for the packaged HVAC room equipment to handle. This concept puts the HVAC SHR and room SHR in much closer balance and gets us closer to that "perfect world".